At its first quarter of the year board of directors meeting, the General Council on Finance and Administration (GCFA) reported that 20 annual conferences paid 100% of their general Church apportioned funds for 2013. The Central Texas Conference was one of two South Central Jurisdiction conferences to meet this mark, and the lone CMG star from Texas. In 2013, the CTC’s overall payout to Connection Mission Giving (CMG = apportionments) went up 4.08 percent from the previous year and represents an increase of $188,712. Totals which Bishop Lowry termed “Outstanding!” in a recent blog post. Over all, the 2013 totals represented an 89.73 percent apportionment payout, which was only slightly behind the 2012 payout of 90 percent, which was the highest in several years. The 20 annual conferences that met the 100 percent mark are (in alphabetical order): Alaska, Baltimore-Washington, Central Texas, Desert Southwest, East Ohio, Greater New Jersey, Holston, Illinois Great Rivers, Iowa, Minnesota, New York, North Carolina, Oklahoma Indian Missionary, Peninsula Delaware, Red Bird Missionary, Tennessee, West Michigan, West Ohio, West Virginia, and Western Pennsylvania. Watson also shared the development of an integrated marketing and communications plan that will expand the agency’s connection with the UMC through the use of all forms of communication including social media. She also announced that GCFA will integrate its website into the newly revised umc.org. The new site will launch later this spring. The board received a thank you from General Secretary Barbara Boigegrain of the General Board of Pension and Health Benefits (GBOPHB) for GCFA’s support of the Central Conference Pension Initiative (CCPI) to fund pensions for clergy throughout the global United Methodist connection. 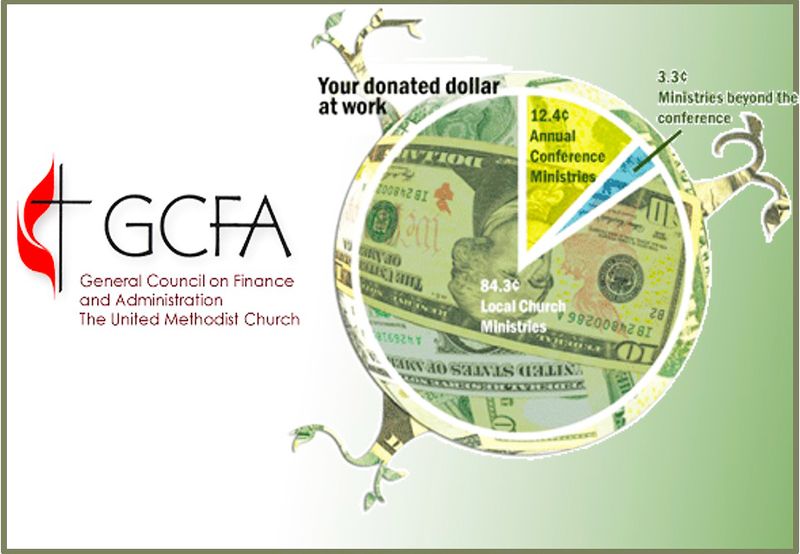 With the Central Conference Pension Initiative reaching its $25 million fundraising goal, she reported that clergy around the world, including every eligible central conference pastor, now have reliable pension support through their conference and/or government program. Boigegrain commented that it was the work of several entities of the Church that steered this program to its fruition. Boigegrain and Tim Koch, Chief Financial Officer of GBOPHB, presented GCFA with a plaque commemorating its work in the support and implementation of the initiative.